Today Rowkin launched 2 new products on the market! They’ve got them named Surge & Micro. They each have a target audience and I’ve taken a liking to the Surge. They are made for someone that has a busy life style, whether that’s being active, running, jogging, biking or simply the avid urban explorer, the Surge will fill in that gap. They are both wireless and communicate with each other a such. No wires mean a tangle free zone. Many brands have been dipping in the true stereo wireless free experience. However, not many have been able to do it properly. In fact, I don’t know many brands that have been able to produce something that was a game changer. From my experience with Rowkin and the Surge, this might just be something you’d want to put your hands on for $129.99 USD. The wireless freedom of real stereo Bluetooth independent ear buds wirelessly syncs to each other. With anything wireless, I’ve also had my share of growing pain, I tend to keep my phone in my pocket when I’m out and I would assume that most guys do. Here’s what I noticed, if I kept a smartphone case on while I had the phone in my pocket, I get some interference when moving around outside. If I stood still that would be fine. I took the case off and through the phone back in my pocket and went on my way and that seemed to fix the interference. While everyone knows Bluetooth can interfere with almost anything that’s around, it’s a good thing to note that it may just be easier to carry your phone in your hands. I don’t see this being much of problem as we have plenty of smartphone zombies roaming the city. I was impressed with the sound quality the Surge offered. 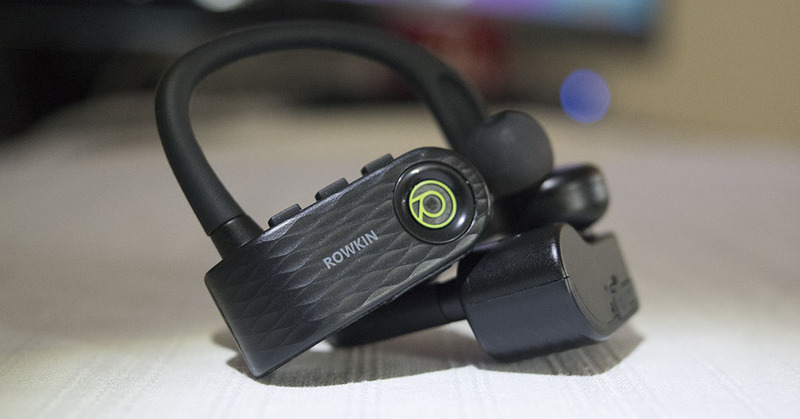 I haven’t had the pleasure of using other Rowkin products to be fair, but I’ve had my share of Bluetooth in-ears. The bass was deep and rich, it was able to get those awesome feels from the kicks while listening to some trendy EDM. Leaving the EDM aside for a bit, I went into the vocal aspect of music by reaching out for some acapella and I was quite pleased with the very clear, definitive aspect the sounds produced when enjoying some of the finer taste in music, nothing would be complete without going for those high notes with some classical music to bring some inspiring moments while creatively writing this review. The price is just right for $129.99 USD. I’ll give this pair of rowkin a 4 out of 5 when it comes to sound and music. Where I’ve ducked a point on this is for the form factor and wireless connectivity. While, I don’t and shouldn’t have to remove the case to get a better signal, I’d like to see them improve on the Bluetooth connectivity and the pairing connectivity of the device.